Tales Toolkit Update and a Discount Code! This Saturday I have the great pleasure of sharing a guest blog from Tales Toolkit. If you haven’t come across Tales Toolkit before…I think you are going to love it! Hello, It’s me again, Kate, founder of Tales Toolkit! We love Alistair so much we’re back for another blog and this time we’re making it official and taking up permanent residence in Alistair’s website sidebar. Whoop. Big thank you Alistair for backing and believing in us. Like you, we know that story is a super powerful learning gizmo. So Tales Toolkit provides interactive, child led resources all using easy to remember symbols to represent story structure. Our kits give children the independence to create stories around their interests using anything they have to hand; old sock, conker, picture of the teacher! These resources are provided with online training for teachers and on-going support to ensure progress is made across many areas of learning. As a former Deputy Head I know how important it is for resources to have maximum impact with minimum planning and paperwork (unicorns do exist!) and so I have worked really hard to design Tales Toolkit with this in mind. Today I want to talk about what we all really care about – impact, (I know you love that word!) ensuring the littlest of people have the best possible opportunities. Read on to find out more. Tales Toolkit provides a supportive environment for reluctant talkers, children with EAL and those with low levels of language. Stories can be created using only a few words, a child’s home language or actions, signing and mark making. Over time you will see an increase in the vocabulary and confidence of your children. We’ve been amazed at the stories from schools. We believe it’s not a race and children learn at their own pace so have designed Tales Toolkit to adapt to the child’s level, building confidence, developing empathy and nurturing creative problem solving from any starting point. 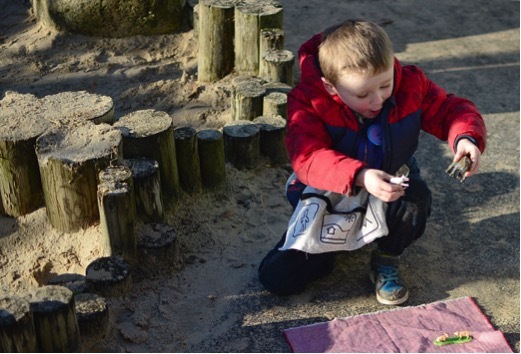 Once familiar with the character-setting-problem-solution story structure that the Tales Toolkit resources use we have also seen children use the same structure in their play to help them solve everyday problems. Tales Toolkit stories are interactive, fun and led by the children. This lights the lust for learning in your children, leading to high levels of engagement and attention and a passion for story leaving children wanting to tell, retell and write their own stories. Our online films train teachers to include early phonics in storytelling and make links with core books. Our writing resources all using our same four symbols help children build muscles for writing so they can move from large messy mark making of stories to longer story writing. Imagination is a mind-set for creation. As children become more sophisticated in their storytelling, they move away from obvious props – such as a bear, Frozen’s Elsa and magic wands – to symbolic props, such as leaves and stones. Soon they can create stories anywhere with anything which is really exciting as this symbolic play is key for later literacy. Stories are fast paced, keeping the children innovating and as they learn there are no wrong answers their ideas become more creative. 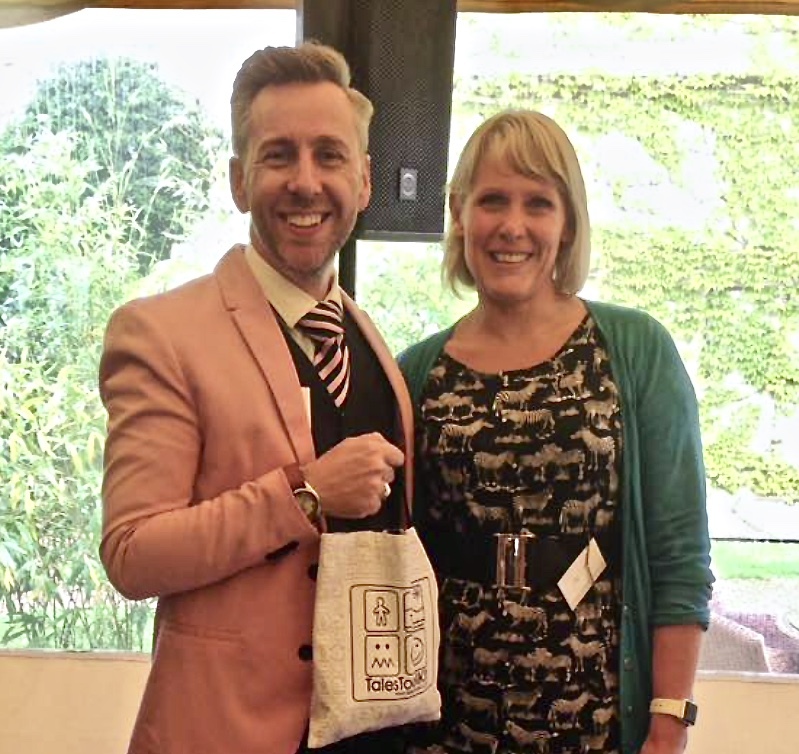 Dr Julian Grenier, Head teacher, Author, Founder of Partnership Teaching School. By creating this fun, safe space where you take on the children’s ideas, include their interests and bring them to life with lots of interactive, tactile excitement, (actions, song, large props, puppets and lots more) we found that lots of the trickier groups of children are engaged and learning. Children with SEND respond really well. 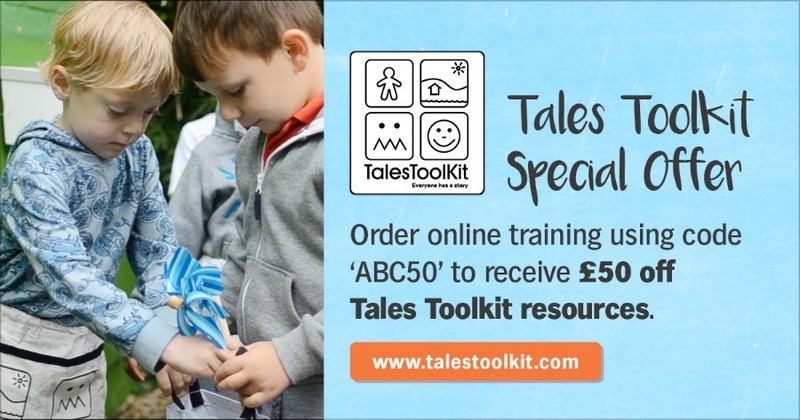 Our resources are easy to use with Makaton and PECs We’ve had feedback that Tales Toolkit is super effective for children with autism as it develops their creativity and gives them a way into their friends play. And we have lots of schools using Tales Toolkit successfully with 2 years olds with fantastic results. Ceri Ann Knoller. Assessment Centre teacher. And we won the Teach First Innovation award 2015/16 for our ability to make a difference to children eligible for pupil premium funding. And Goldsmiths University believe in us and are funding a study to measure progress made. By now we hope you’re wondering how you get your hands on Tales Toolkit. We manage to make such a huge difference for schools by providing you with the right training and lots of support for a whole year. Check out our previous blog for information about what’s included in the pack. We’ve been working with top experts and leading schools to develop training that really works! We made 5 films, each 50minutes long so you can fit them into a staff meeting. You get together as a team with no additional supply costs! The training is delivered over time which gives staff time to really embed each stage before moving on. “A real strength is the quality of the training materials which bring together a wealth of sound practice in an accessible and supportive format which you can watch again and again and we have! Yes, definitely one of the best resources we have bought this year- an educational bargain!” Alex Law. Head teacher. Harry Roberts Nursery School. Session are led by me, Kate, and include interviews with experts, teachers using Tales Toolkit, footage of the children using the resources and activities for you to do as a team. Our resources are super simple to use. Staff really enjoy our training and find Tales Toolkit easy to implement and make their own. And we learn from you! We want you to be part of our family. Let us know your needs and share your stories with other schools. We keep adding to our training over time with films, webinars and best practise ideas. And we have some Superstars webinars – Dr Alice Jones Bartoli discussing violence in story Dr Julian Grenier chatting about Ofsted and Tales Toolkit, John Webb exploring music and story. And the main man himself Alistair is doing a Tales Toolkit webinar about early writing on the 24th May. So, if you join Tales Toolkit in the next few weeks you could soon be chatting with Alistair online (It’s the handbags at dawn photo again Alistair!). Sound good? Has this made an impact on you? So, you can see when you add it all up. It’s a great package. I know you’re all wanting to know the price! It’s £800 for the year which gives you all of the following. Schools signed up for our training have been forward thinking innovators willing to jump with something new that has big potential to make a difference. We’d love you to join them and become part of our family and start sharing your stories! If you are already a ‘Tales Toolkitter’ then feel free to share your thoughts and experiences in the comments section. Tales Toolkit was the highlight of our week in Nursery when I was teaching!! Now we have our own Nursery really can’t wait to introduce it as the impact on children’s development, particularly speech and language, is evident from the very start!! Thank you for your great comments! We love hearing your stories! if this is as easy as its sounds and impacts as explained then I’m for using Tales Toolkit. Please can you email me info I like the fact there are five training sessions we can dip in and out of. Also webinars how useful to be linked to others using it. This looks brilliant fantastic with the online training means I don’t have to pay for supply teachers. You mention five training sessions can you run these in one day? I’ve used Tales Toolkit many times from nursery to year four ALL children love it and participate,reluctant speakers, EAL, to the boys! There is no planning and you can include all areas of learning. Many times I have heard children on the playground say ‘oh no we have a problem’ the children will then find a solution, brilliant. Children happily become independent writers wanting to tell their story! Using Tales Toolkit has had a huge impact upon the children in my class. The structure can be adapted to teach any theme and it’s this flexibility which benefits me as a planner. Tales Toolkit meets all kids where they are at and lets them unleash their creativity. And – it helps teachers help children write. I cannot wait to see the uptake from this new offer, stories shared and the impact on the children you work with! Using Tales Toolkit I’ve seen a huge difference made to the children in Nursery. Improved their language, creativity. They’re more focused and confident. They’re using the words problem/solution to fix problems in their play. Great to see them look for solutions. Highly recommend this to anyone thinking of buying!